Don't you love this time of year? It's the beginning of some cooler mornings and evenings and when a nice cool breeze blows through when we are at market or with friends, or just one another, we both nod and say "Yup, 8 months of heat and we finally have this !" The thing is, Fall in Florida, as everyone knows, very different from much of the rest of the country and it makes us always stop and be thankful for where we live..yes, we might not have colorful leave changes, and we may not be surrounded by Apple orchards in North Carolina, and we probably are not pulling out the warm woolens any time soon, but this is what we can do - we can step out our door and not feel like we are stepping into an oven, we can actually open our windows, and the best part, this IS really the best, happiest time for our gardens..because...they are resting, comfortably. They are not stressing over 90 plus degree heat every day, they are relaxing into a time when they don't have to put out a lot of effort to just survive..trust us, plants love this time of year..they can relax, they don't have to put a lot of effort into growing or striving for some thirst..they can still bloom and flourish but they can do it at a relax rate....they are just letting out a big "Ahhhhhhh"....don't believe me? Check your garden out and tell us what you think ! This time of year is always a great time for cleanout and brush up, a bit of weeding, maybe some new mulch, and adding some seasonal color.It's a good time to rethink and re-do, if you want, of what you have happening. Mitch and I both have our favorites of years old, and sometimes, especially in the Fall, we say, "okay, time for a change, let's switch out, or renew, or gift an oldie but goodie to a fellow garden lover ! I found a gorgeous pic of one of Pinterest. Yes, it does it's "pink thing" in the fall into Winter. 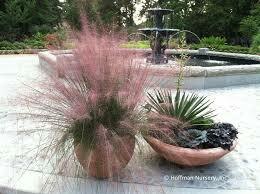 Gorgeous fluffs of pink color just says 'wow" ! 'And even when it's just green, it's a great hardy draught tolerant grass in your landscape. Herbs..herbs and more herbs.....Let's face it, most herbs hate Florida summers, except for Rosemary. What do they hate? Our humidity....that's why Falls into Springs is really the best time to have success with Herbs..they love the sun and lower humidity of Fall and will grow and thrive whether in-ground or in containers. Basil, Lavender, Dill et all, will all be happy this time of year for you to include them in your garden, for their great aromas and great culinary uses too. Bougainvillea - A Florida hard favorite, and we have them in hanging baskets, for easy maintenance and beauty. 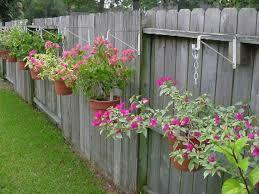 Did you know that bougainvillea thrives when it is not so rainy? It's true, during our rainy summer time, they will grow and grow, but won't bloom much, but with Fall being a dryer time, they love it. loving a lot of sun, our beauties with grow and flourish and flower thru summer and winter time. 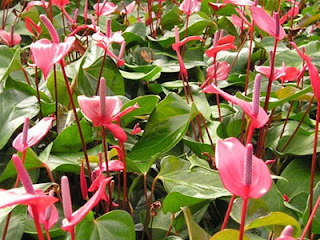 Anthuriums are about the most perfect shade and/or house plant around. Long lasting, every-blooming, they bring great color to your yard and house and don't need much attention. The "Oblifilio" at right , is one of Annie's favorite new plants. The foliage reminds us of the texture and look of a watermelon. 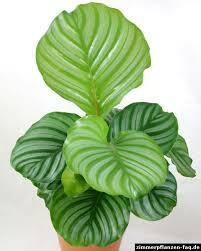 Large, striped leaves make a dramatic statement. 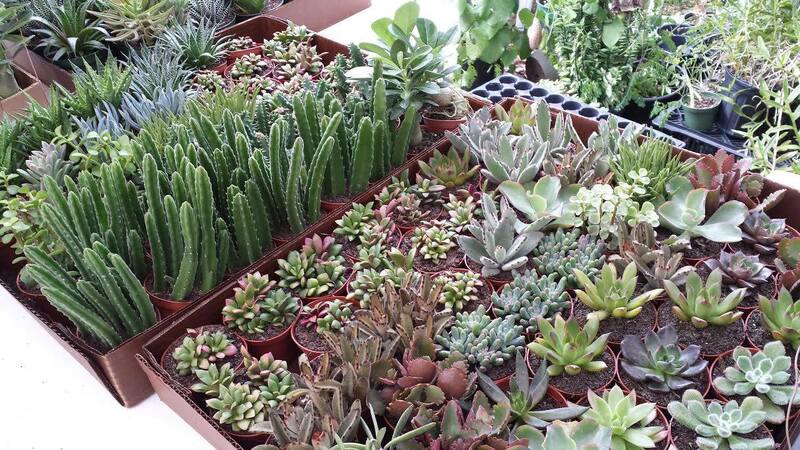 As always, we continue to strive to provide our customers with a great assortment of fabulous Succulent plants - it is said that Succulents will be one of the most popular group of plants of plant enthusiasts for the new millenia...easy going, easy care, not needing much water, they bring great texture, color and interest to veteran gardens and newbies alike ! An added feature to our booth at market each week, we are adding an area of cuttings and starter plants for gardeners that "want to do their own thing"....with as much stock as we have, sometimes we have to take cuttings to manage our crops, and we thought the best thing was to share with our customers - all value priced, check out our new " do your own thing" table ! Hope to see you at market this weekend, we will be handing out "treats" throughout market day...customers that show up in costume will get special favors ! !